The struggle for self-determination by Southern Cameroons' pressure groups has recorded another giant step. This is so because a group advocating for the cause has taken the matter to the House of Lord in the United Kingdom. Reports say Southern Cameroons flag was raised in London on March 26, 2016 during a conference on Self-determination organized by British Lawmakers. The group known as Ambazonia Movement was in UK to submit a memo at a Human Rights Conference on Self-determination on the invitation of UK Lawmakers. The chairman of the Conference Lord Nazir Ahmad is quoted to have said that he is determined to bring to the awareness of the British the need to support groups advocating for such a cause that would give them the right to self-determination. He cited South Sudan and East Timor as practical cases. Newspaper reports also revealed that the delegation (Ambazonia Movement) from the Southern Cameroons was made up of Roland Tewre, Robert Tamanji, Dr. Ekiko Francis and Pride Mbi. Accordingly, the delegation submitted a Memo on the violation of human rights by the government of La Republique. Note should be taken that in 2014, Mola Njoh Litumbe took the issue to the Upon and upon his return he told Cameroonians that he wanted the UN to examine into the petition by Southern Cameroons against La Republique. Of late, a mixed delegation of SCNC and SCAPO traveled to Nigeria to share with the Biafra activists. Notwithstanding, several activists have been arrested and detained for advocating for the cause. Prof. Wole SoyinkaCulture is closely intertwined with tourism – the former, in fact, often drives the latter. The destination uppermost in the minds of most tourists we know is – Culture. This means that both share friends and – enemies. Of the principal enemies, seeing that we find ourselves within the precincts of governance, I intend to engage your attention in this brief address to just one: Insecurity. That inability of any vacationist to let go completely, relax, submit oneself completely to the offerings of a new environment – the sounds, sights, smells, textures and taste. Of Culture itself, in and or out of the touristic intent, there is no ambiguity in the mind of its enemies. They make no bones about their detestation – call them Taliban, Daesh or ISIS, al Shabbab or Boko Haram. Their hatred is pathological and impassioned to a degree that goes beyond the pale, beyond insanity and sadly beyond cure. The duty of governance towards such retrogressive outbreaks remains unambiguous.After Boko Haram, what next? In fact, at this moment, Boko Haram has no ‘after’ since it is by no means ended, no matter what technical expressions such as “militarily degraded’ means. But let us assume indeed that we are already in the past of Boko Ha-ram. It is now clear that the succession is already decided, the ‘vacated’ space is already conceded, and that the new territorial aspirants are already securely positioned. The entire nation appears to be theirs without a struggle, and the continuity of an established Nigerian necropolis north to south and east to west is being consolidated.Some necropoles are actually architecturally fascinating. They attract visitors from distant places, but those are works of veneration, artistry and dedication. They are visual feasts, among whose structures the visitors actually picnic, leave flowers and symbolic gifts to hovering ancestors. Latin America is full of them. The Nigerian widening necropoles leave only the taste of bile in the mouth, the corrosion of hate, stench and rage.When I read a short while ago, the Presidential assurance to this nation that the current homicidal escalation between the cattle prowlers and farming communities would soon be over, I felt mortified. He had the solution, he said. Cattle ranches were being set up, and in another 18 months, rustlings, destruction of livelihood and killings from herdsmen would be ‘a thing of the past’. Eighteen months, he assured the nation. I believe his Minister of Agriculture echoed that later, but with a less dispiriting time schema. Neither, however, could be considered a message of solace and reassurance for the ordinary Nigerian farmer and the lengthening cast of victims, much less to an intending tourist to the Forest Retreat of Tinana in the Rivers, the Ikogosi Springs or the moslem architectural heritage of the ancient city of Kano. In any case, the external tourists have less hazardous options.However there is also internal tourism, to be considered a premium asset – both economically and in spirit of nation building and personal edification. This was an exercise I indulged in in the early sixties as by-product of other engagements, such as research. A lot however was simply under curiosity. I can claim modestly claim to be among the top twenty-five percent internally traveled Nigerians, acquainted with the smells, textures and tastes of their geographical habitation. I wish the late Segun Olusola were around to testify to the sudden bouts of tourist explorations we made in his Volkswagen Beetle in the pre-war sixties.But now, would the young adventurous set out to visit the mystery caves of Anambra and its alleged curative pools from mere interest? They would think twice about it. It is not merely arbitrary violence that reigns across the nation but total, undis-puted impunity. Impunity evolves and becomes integrated in conduct when crime occurs and no legal, logical and moral response is offered. I have yet to hear this government articulate a firm policy of non-tolerance for the serial massacres have become the nation’s identification stamp. I have not heard an order given that any cattle herder caught with sophisticated firearms be instantly disarmed, arrested, placed on trial, and his cattle confiscated. The nation is treated to an eighteen-month optimistic plan which, to make matters worse, smacks of abject appeasement and encouragement of violence on innocents. Let me repeat, and of course I only ask to be corrected if wrong: I have yet to encounter a terse, rigorous, soldierly and uncompromising language from this leadership, one that threatens a response to this unconscionable blood-letting that would make even Boko Haram repudiate its founding clerics.It is now close to a year since I attempted to utilise the Open Forum platform of the Centre for Culture and International Understanding, Oshogbo, to launch a national debate on the topic – SACRED COWS OR SACRED RIGHTS. The signs were already clear and the rampage of impunity was already manifesting a cultic intensity of alarming proportions. For reasons which are too distasteful to go into here, the forum did not take place. We were already agreed that General Buhari be invited to give a keynote address, based on his long experience in such matters as former head of state, and as a cattle rearer himself who might be be able to penetrate the mentality of this ‘post-Boko Haram’ pestilence’. That challenge remains open, but should now involve this gathering, which surely includes tourist and educational agencies. They should join hands with human rights organisations, the Ministry of Agriculture, Farming and local Vigilante associations etc. It is a gauntlet thrown down to be picked up, and urgently, by any of the affected or troubled sectors of society, or indeed any capable and interested party at this conference. The CBCIU is prepared to collaborate.Let me narrate a personal experience – just one among many – that was brought home to me, right against my doorstep. Before that specific happening, I had observed a change of quality in forest encounters with cattle herdsmen over the years. These changes had become sufficiently alarming for me to arrange meetings with a few governors and, later, with the late National Security Adviser General Azazi. 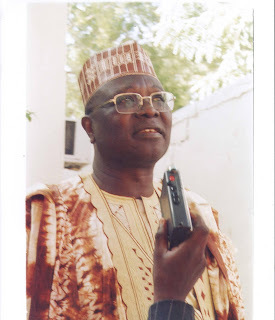 At the time, we thought that they were Boko Haram, infiltrating into the South under guise of cattle herding. That was then, and of course that surmise has never been firmly proven or disproved.Recently however, I returned from a trip outside the country about to find that my home ground had been invaded, and a brand-new “Appian way” sliced through my sanctuary. That ‘motorable’ path was made by the hoofed invaders. Both the improvised entry and exit are now blocked, but interested journalists are invited to visit. In over two decades of living in that ecological preserve, no such intrusion had ever occurred. I have no idea whether they were Fulani or Futa Jalon herdsmen but, they were cattle herders, and they had cut a crude swathe through my private grounds. I made enquiries and sent alerts around, including through the Baale of our neighborhood village. There has been no repeat, and hopefully it will remain the first and last of such invasion. What it portends however is for all thinking citizens to reflect upon, and take concerted measures against.Herdsmen, let us appreciate, are perhaps humanity’s earliest known tourists. They must be taught however that there is a culture of settlement, and learn to seek accommodation with settled hosts wherever encountered. The leadership of any society cannot stand idly and offer solutions that implicitly deem the massacres of innocents mere incidents on the way to that learning school. For every crime, there is a punish-ment, for every violation, there must be restitution. The nomads of the world cannot place themselves above the law of settled humanity. The Catholic church has issued a direct warning to women who wear provocative dresses to church to abruptly stop in their tracks. Technical School of Agriculture-TSA Nkambe, a one-time citadel of standards is reported wallowing in the gutter and desperately in need of divine intervention from the Ministry of Agriculture and Rural Development. In fact when a critical judgement analysis is made of the petition by pedagogic staff and the protest march they staged last week over obnoxious practices instituted by school administration, TSA Nkambe may have been sacrificed to those who are at their worst given the vision that institution once incarnated as the window of professional training in Donga Mantung Division is on its last legs. The one-time most admirable training institution which in the 90s stood the taste if time and was the pride of the entire division has been sparked by an irreplaceable spark, in the hopeless swamps of the approximate, the not-quite, the not-yet, and the not-at-all looms as precarious indication predicts. One keep wondering whether with the present stalemate, the school will be able to train rural entrepreneurs as prescribed by the Ministry of Agriculture and Rural Development. According to information gathered, TSA Nkambe has been transformed into a sink hole that puts to question the present state of nature of the school. It is unbelievable that pedagogic teachers are threatening went on strike because the school administration could not afford to provide them little allowances. As to what has been happening to the huge credit disbursed to the institution remains another mystery that could only be deciphered by very competent agents from CONAC. At the time of writing this report, an authoritative in the Ministry of Agriculture and Rural Development hinted this reporter that the Ministry is aware of the situation at TSA Nkambe. Public opinion in Donga Mantung is aghast that since last year these teachers complained the school administration didn’t want to provide them the little allowances until they had to stage a protest march to meet the Senior Divisional Officer- Ngone Ndodemesape Bernard for an immediate solution or else the unexpected happens. The issue according to what we gathered exploded today October 16, as the teachers stormed the SDO’ office threatening. It is even said that the mayhem at TSA Nkambe is a hot potato in the hands of the administration that could take the school to slumber any moment. More so, there is a lot of controversy surrounding school fees and the none existence of farms for students to carryout practical exercises. Loneliness and social isolation in general, is something that can adversely affect our lives and lead to premature death. People who are lonely and isolated may face a higher risk of heart disease and stroke, researchers report. According to HealthDay Reporter, WebMD, social isolation raised that risk by about 30 percent, exerting the same level of influence on heart health as risk factors such as anxiety and job stress, the British review found. The researchers analyzed data from 23 previously published studies that, in total, included over 180,000 adults, more than 4,600 of whom had heart attacks, angina or died and more than 3,000 who had suffered strokes. The result from the pooled data showed that loneliness and social isolation were associated with a 29 percent increased risk of heart attack or angina attack and a 32 percent increased risk of stroke. These findings suggest that loneliness and social isolation need to be taken seriously. In a series of tweets released on Sunday evening on his official Twitter handle, @NGRPresident, President Muhammadu Buhari, last night, appealed to Nigerians to bear with him over the difficulties in the land, saying Nigerians were seeing the darkest days before dawn. While appealing to Nigerians who he said were known for their inner strength to soldier on, he said the change which they voted for was at the corner and about to rock every nook and cranny of the country. In a strategic move to counter the difficult times, the President ordered the release of 10,000 tons of grains from the national strategic grains reserves. The move, according to Presidential spokesman, Mallam Garba Shehu also debunked insinuations that the change mantra of the new administration was concomitant with hard times. The Presidency said a total of N9 trillion was lost by the Federal Government to the Boko Haram insurgency, lamenting that the loss worsened the economy. Noting the crippling fuel situation, the administration also observed that it inherited a N600 billion debt owed fuel importers and that it was working on ensuring that newly-licensed refineries commenced operations in 2018. While noting that the Federal Government’s social programmes, including the payment of N5,000 monthly transfers to eligible Nigerians was set to commence, the Presidency called for more understanding from Nigerians on the challenges it said it inherited. The Presidency further averred that the difficult times were caused by the economy downturn arising from, "the Boko Haram insurgency, corruption and the lack of planning by the past administrations and one that should not be blamed on the Change Agenda of the Muhammadu Buhari administration. The Presidency firmly rejects the insinuations that poverty and lack are products of the Change mantra." "Change is a process. Change does not happen overnight. Change can be inconvenient. Change sometimes comes with pain. Over the past year, the government has been working night and day to deliver on its promise of change to Nigerians, and the painful process is still ongoing. "This is work in progress. As life gradually returns to normal in much of the country and the northeast in particular, agriculture will resume and traders from neighbouring African countries will once again feel safe to do business with us. "It is estimated, for instance, that three Northeast states of Nigeria alone have so far lost about three trillion Naira (Nine billion US Dollars) to the Boko Haram insurgency. The previous administration at the center said Federal Government losses amounted to about USD18 billion. "It would have been a miracle for our country’s economy not to feel the effects of this. And, in addition to the thousands of lives lost to the insurgency, thousands have also lost their means of livelihood. "At the time this government came to power, about 600 billion naira was owed to fuel marketers in subsidy payments. Strategic fuel reserves were depleted and local refineries not functioning. "One of the President’s first steps was to pay off the marketers, leaving an outstanding of about N150 billion which is captured in the 2016 budget. The Port Harcourt and Kaduna refineries are being brought back to life. Shortly, Nigeria will resume refining its own fuel rather than depending on imports. "As part of the permanent solution of recurring cycle of petroleum products shortages, government is working on a plan to ensure that some of the newly-licensed independent refineries start coming on stream from 2018. "Government is also turning its attention to the sabotage of the oil and gas infrastructure that has taken so much away from the generation and distribution of electricity. These are just some aspects of the change that Nigerians voted for, a change that is happening and which will soon be felt by Nigerians in every nook and cranny of our country. "Nigerians are a people renowned for our inner strength and our ability to triumph. These are just the darkest days before the dawn. The change Nigerians voted has indeed begun." At an award ceremony held in Antioch, California, former President Goodluck has been honoured by the cities of Antioch and Lathrop in California for promoting peace and democracy in Africa. For promoting Peace and Democracy in Africa former President Goodluck has been honoured by the cities of Antioch and Lathrop in California in the United States of America at an award ceremony held in Antioch, California, on April 23. During the event, the mayor of the city of Antioch, Mayor Wade Harper, expressed his admiration for Goodluck Jonathan and declared that the city of Antioch, California, was proud of his legacies, especially his act of overseeing free, fair and conclusive elections and leaving the scene when the ovation was loudest. Goodluck Jonathan, who was represented by his former aide, Reno Omokri, gave a goodwill message to the two cities that had gathered to honour him as well as to the Nigerian community in the Bay Area of California. Below is former President, Dr. Goodluck Jonathan’s message on the occasion. I send this message of goodwill to the Nigerian community in the Bay Area of California who have gathered at Open Heavens Community church to celebrate with me as I am honored by the cities of Antioch and Lathrop. I had planned to be there. Indeed I had concluded travel plans. Unfortunately, due to circumstances beyond my control I could not make the trip. I have always been proud of Nigerians in the diaspora and more so of Nigerians in the US and even more so of the Nigerian diaspora in California. Some of you may recall that upon my ascension to the office of President on May 6th, 2010, one of my first acts was to open up a Facebook page to personally interact with Nigerians. In June 2010, a diaspora Nigerian from the Bay Area of California informed me on my Facebook page of an abandoned building belonging to Nigeria in San Francisco and I dispatched our then ambassador to that city to claim the property and renovate it. Hopefully, the building may again host a consulate as it once did in the 80s. The point I am trying to make is that I have been communicating with you and I see you as an asset to Nigeria that makes me proud. Elsewhere, I have mentioned that aside from oil, diaspora Nigerians are the single largest source of capital inflow into Nigeria. In my last year as President you remitted $21 billion home. Much more than the World Bank, IMF and foreign direct investment. My people, you are an asset to your fatherland. Because of the importance with which I held you, my administration facilitated direct flights to Nigeria from the US to Nigeria. We ensured no less than three airlines fly direct between Nigeria and the US including one from Houston to Lagos for the benefit of those of you from the West Coast. We also ensured that Enugu airport was upgraded to an international airport and I recall that a number of diaspora Nigerians from the US boarded the inaugural Ethiopian airlines flight that landed there in August of 2013. Again let me say that I appreciate the Nigerian community in the Bay Area. I would also want like to thank Mayor Wade Harper and the council members of the city of Antioch for choosing to honor me for my efforts in promoting democracy. I am indeed humbled by their thoughtfulness in recognizing our modest efforts. I also wish to express my gratitude to the city of Lathrop and its mayor and council for also deeming it fit to recognize our efforts. I wish I could be there in person, however, I have asked Reno Omokri to represent and I am with you in spirit. Thank you and may God bless Nigeria, may God bless California, may He bless the cities of Antioch and Lathrop and my God bless you. A legendary musician who has been credited for massively spreading a kind of music genre, has died after slumping right on stage. The Congolese Music legend, Papa Wemba, died around 9:10 GMT in Abidjan, the Ivory Coast capital, his manager, Marie Laure Yaone, has confirmed in a Facebook post. The Soukous maestro, who was performing with his band at the FEMUA 9 musical concert, slumped on Stage at about 5:30 GMT on Sunday. His dancers and members of the Red Cross could not revive him on stage and subsequently rushed him to a hospital where he later died. She had published a post of how the musician slumped and was rushed to the hospital. 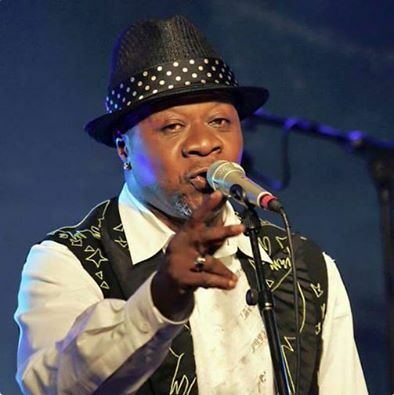 “Papa Wemba fell on stage at Anoumabo, Abidjan where he was performing at the Legislative Femua festival, organized by the Magic System. There’s more scared than hurt. As a manager, I assure you on his state of health and beg you to not put false information. Medical personnel attend to musician Papa Wemba moments after he collapsed on stage. 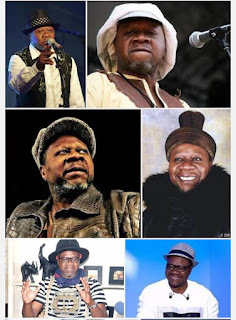 Papa Wemba, whose real name was Jules Wembadio Kikumba, was born on June 14, 1949. He was one Africa’s most popular musicians and perhaps the most influential Soukous performer. He was instrumental in making the genre of music popular worldwide. In February 2003, he was convicted for involvement in the smuggling of illegal immigrants from Democratic Republic of Congo into France. He spent 3 months in prison and was released after paying a fine of €30,000. 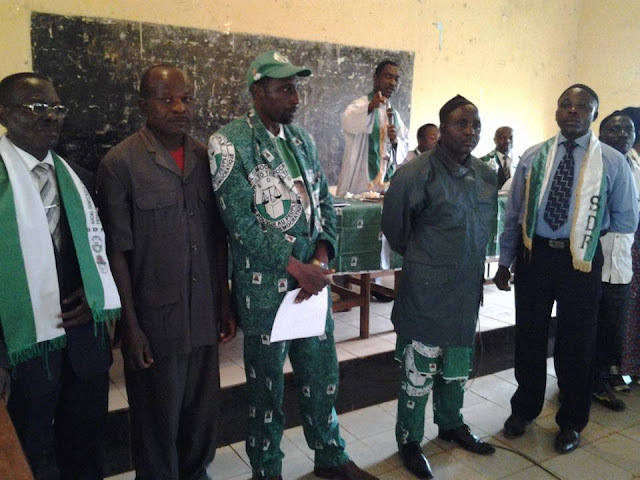 The team led by Njong Donatus, mayor of Kumbo council has exhaled the Nkambe SDF Electoral District for maintaining the spirit of unison after the last reorganization of the basic organs of the Social Democratic Front. 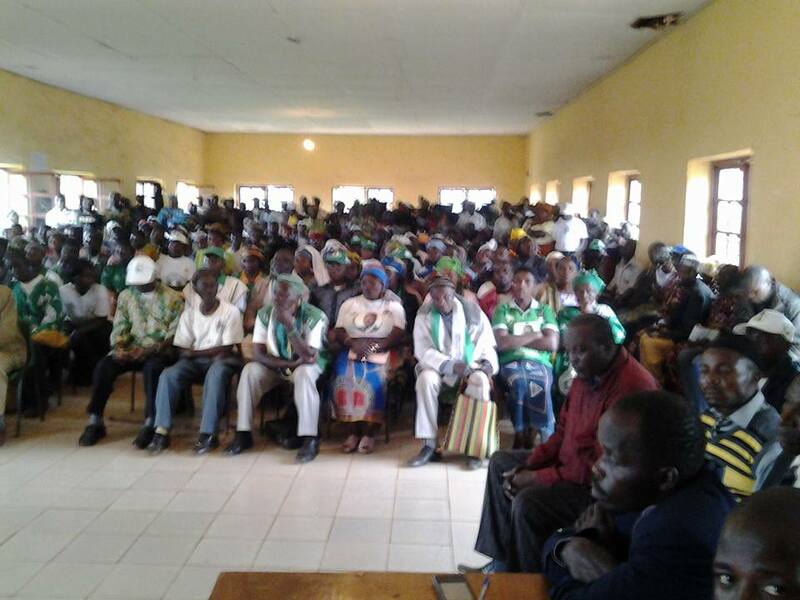 Njong Donatus made the remarks while addressing delegates at an Extraordinary District Conference that took place on Sunday April 24, 2016 at the Nkambe Community hall. 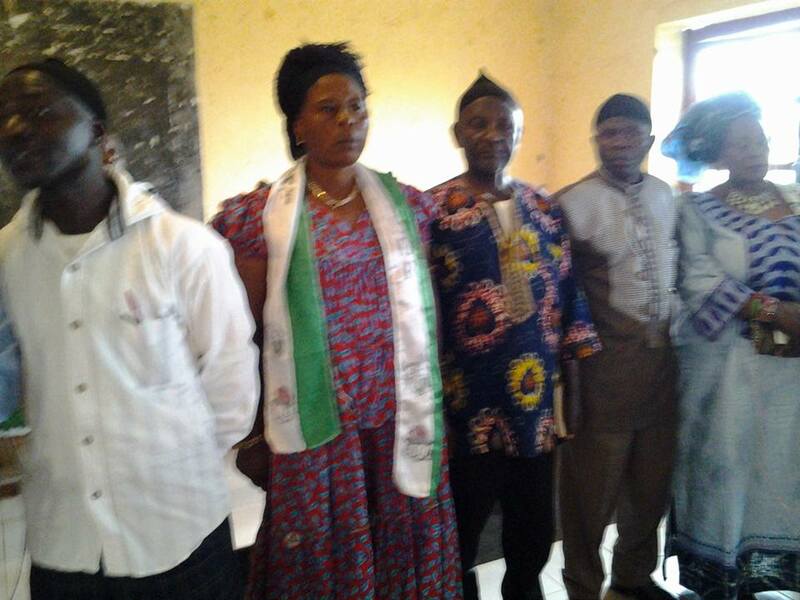 The Njong led delegation from the National Executive Committee of the Social Democratic Front after validating the newly elected district officials charged them to work for the interest of the party. Njong used the opportunity to put SDF local officials to the task by recommending that they should make sure that they are animated by the winning spirit. 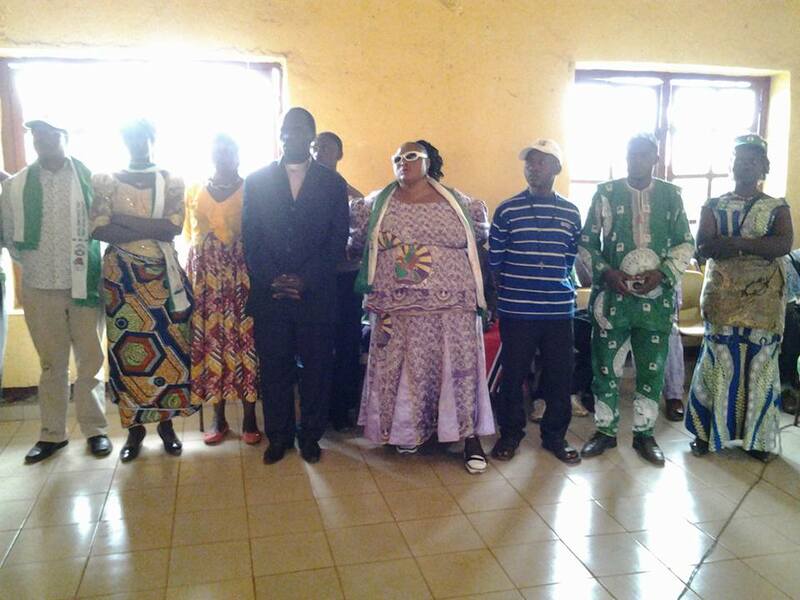 Thus winning back the Nkambe council Njong in the upcoming elections Njong added should be the priority of priorities to the new exco headed by Mbeh Wilfred Shey. During the extraordinary District Conference, delegates also shared their views, experiences and knowledge with NEC members on election matters. Statistics show that about 80,000 acres of rain forest are destroyed across the world each day, and the destruction takes with them over 130 species of plants, animals and insects. Much of that deforestation has been attributed to human activities and to the phenomenon of climate change. Nearly 90% of an estimated 35,000,000 cypress trees are facing extinction in the North West Region of Cameroon. Indicators are rife at that these trees may disappear before this year ends. This is so due to the presence of a strange disease that has attacked cypress trees. 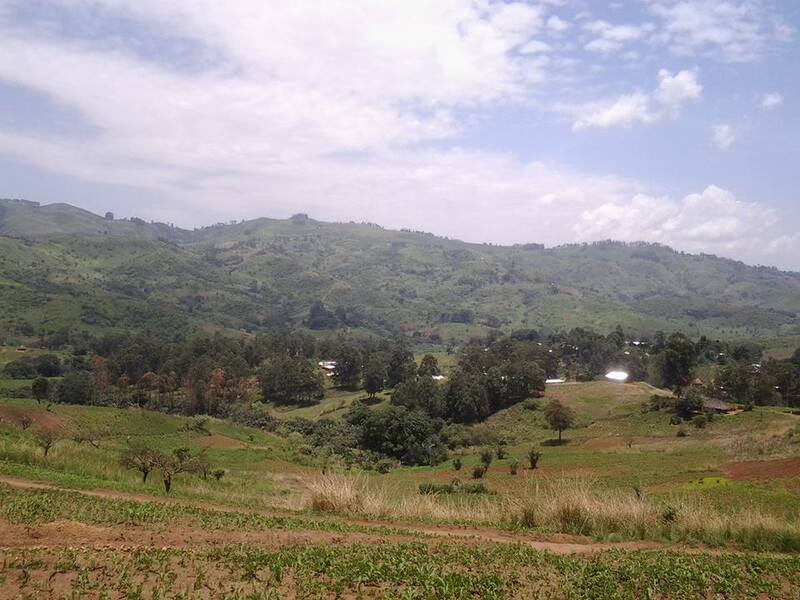 Environmentalists have attributed the present stalemate to climate change, while farmers (mostly villagers) on the other hand say it is an art of witchcraft. Abanda Marcel of Youth Assembly for Justice-YAFEJ describes the situation as pathetic and added that " there is an urgent need for scientists to look into the precarious situation. We have to rescue the cypress trees now or else, the future maybe very uncertain for other plant species". To Kari Jackson, Coordinator of Sustainable Run for Development-SURUDEV, it is the warming climate and the effect of climate change that has started showing its ugly face. "Either we stand up and protect these cypress trees, or see them eroded until we see large-scale extinctions." Jackson says. Yet scientists have been mute over the issue. 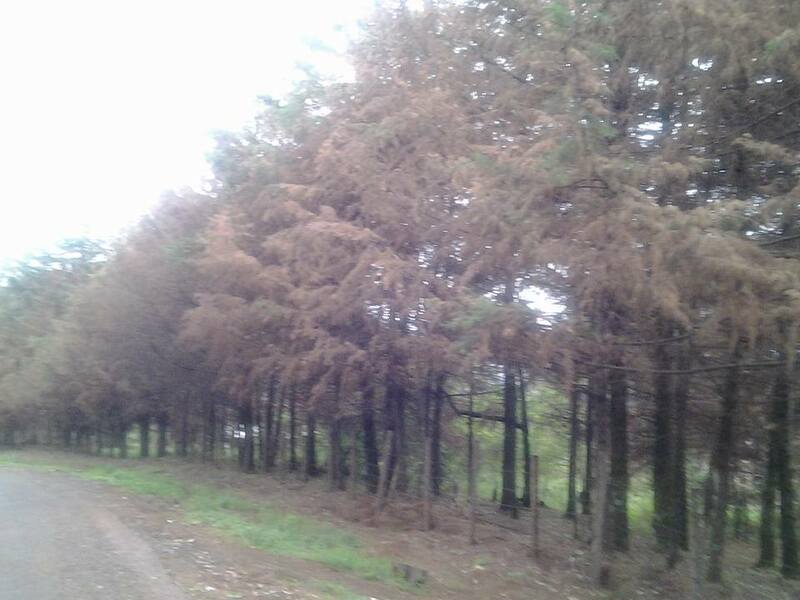 It is not yet clear whether they are on the trail to identify fungus that is causing the dead of an estimated 35 million cypresses in the North West Region. 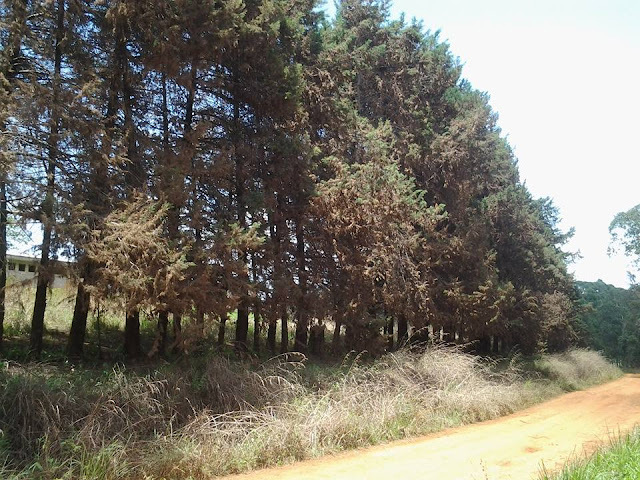 The Ndu Tea Plantation alone may lost over 25.000 cypress trees while individual farmers and homes have also seen their plantations and flower gardens reducing to nothing. 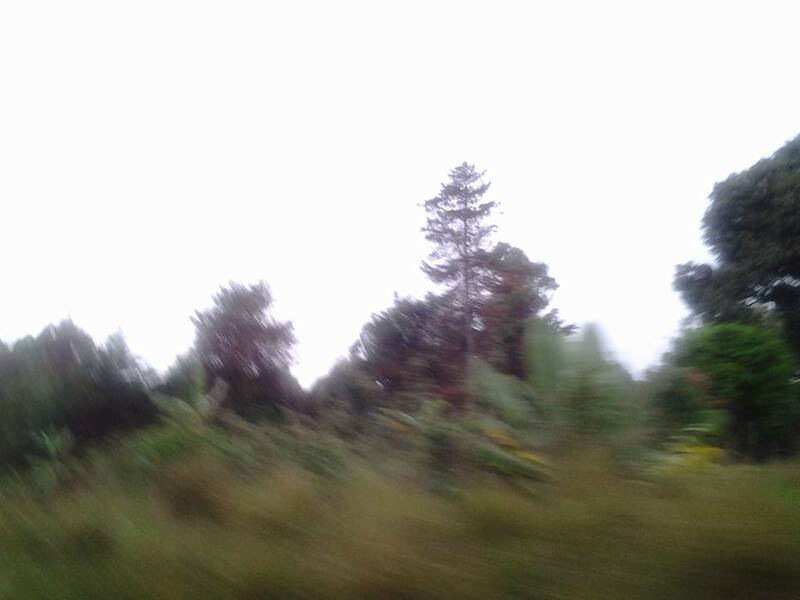 The most pathetic thing is that these are trees that have played a very crucial role in communities. They serve as win-breaks, live fences, fuel-wood, sheds, habitats for birds and animals etc. 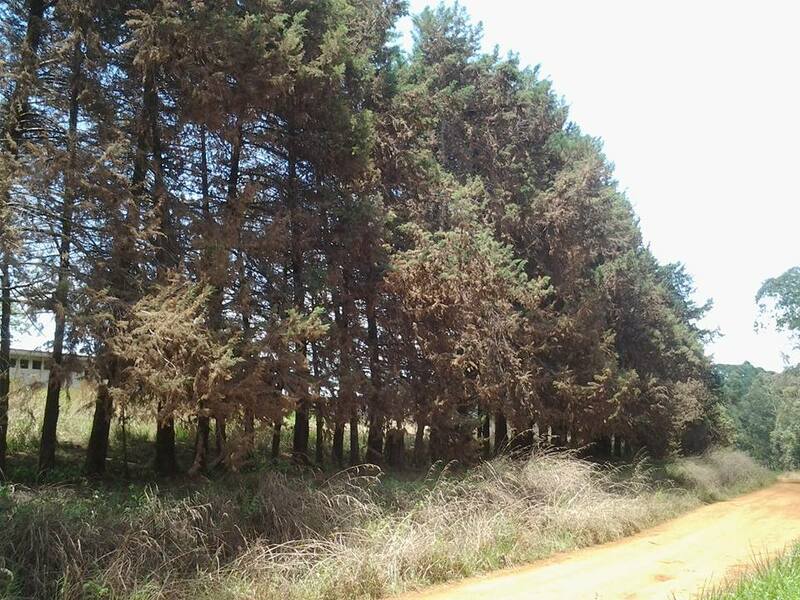 Though cypresses was lately considered as the most resistant tree specie, Vincent Bawe, Manager of Millennium Star Hotel in Nkambe said when he observed some black spots on the live-fence at the hotel, he embarked on watering but it did not produce any results as the trees continuously dried off. "The young plants became “weakened and within two days they leaves change from green to brown”. The situation is very pathetic in Donga Mantung Division, Bui, Ngoketunjia and Mezam as every cypress tree is drying off. In this part of the country, cypresses are mostly used as live-fences, wind breaks and fuel plantations. Every passing day, the green scenery is showing an ugly face as the population look helplessly at the drying trees. It is feared that if the disease attacks other tree species, it may lead to devastating effects. Villagers have started looking at the present stalemate as the beginning of the end of the world. In just the past few days, the precarious situation has had diversified interpretations. It is widely said in villages that the attack on cypresses is an act of witchcraft. The story goes that some witches on a mission to kill all young men in the villages brought an illness and later buried it under a cypress tree. A goat dug it and that is why goats and cypresses have been attacked by a strange disease. But scientifically, the argument has proven not to hold water yet it is widely believed by almost all the villagers in Donga Mantung Division. At the Ndu, Nkambe, Lassin and Misaje markets, the prices of goats have dropped to floor level. Buyers have been scared to the point that a 30-50 kg live weight goat sells at FCFA 3000, approximately 6 US Dollars. Ndi Godlove, a young breeder at Mbabi-Wat says he lost 63 goats in one week. Godlove who is in his early 40s told us that he lost all his lifetime investments. 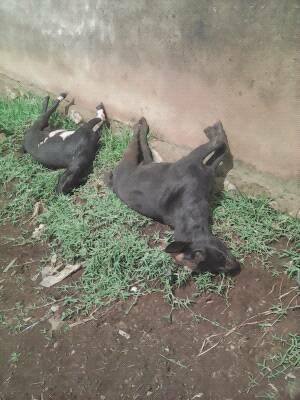 There are stories of breeders in Nkambe and Ndu council areas that have lost over 200 goats each. Though there are no statistics available at the Divisional Delegation for Livestock in Donga Mantung Division, an authoritative voice said thousands of goats have died in the Division within the last one month. Nji Evaristus says animals especially goats are suffering from its worst unknown disease in a millennium. "I vaccinated all my goats and sheep, maybe that is why I did not lost everything". In another related story, villagers have attributed the unknown diseases to witches and wizards. It is said in villagers that some witches and wizards in an attempt to destroy humans have brought jiggers, illnesses to kill cypresses and goats. The same group is also said to have made it in such a way that kola nuts produced the highest fruits this year. In Ndu and Nkambe, in Donga Mantung Division, no one buys kolanuts again. A 15 liters bucket sells as cheap as FCFA 250-500 and 100 kolanuts at FCFA 50-100. Talking about climate change and the heating temperature to them in relation to the unknown diseases is like a fairy tale. Although atmospheric scientists increasingly believe that the exceptionally warm waters over the past months are the early indications of a phase shift in the Pacific Decadal Oscillation, a cyclical warming of the North Pacific that happens a few times each century, traditionalists on the other hand still think that the gods are angry. And that the land has been curse by numerous sacrileges committed by man. Yet they haven't yet figured out precisely what's behind them the present stalemate. It is common occurrence to see a traditional ruler pouring libation to call on the gods to bring back the rain or bring back a drying stream. Papa Wemba, one of Africa's greatest music stars, died Sunday after collapsing on stage during a festival in Ivory Coast. The Congolese world music legend, renowned as the "king of Congolese rumba" for the fusion of Cuban and electronic rock that he pioneered in the 1970s, was 66. He died after falling ill during a set at the Urban Musical Festival Anoumabo (FEMUA) in Abidjan, the first major cultural event in the country since a jihadist attack on a beach resort last month. Video footage broadcast live on television showed the dramatic moment that Papa Wemba -- wearing a bold black and white patterned tunic and oversized bowler hat -- slumped to the floor behind a group of dancers, before performers rushed to his aid. FEMUA organisers expressed "deep sorrow" at the death of a man who has been at the forefront of African music for more than four decades. "Papa Wemba wanted to die on stage, that's what he told me two weeks ago when I spoke to him on the phone," festival promoter and singer Salif Traore, known as A'Salfo, told AFP. A'Salfo, lead singer with the Ivorian group Magic System, said he understood Papa Wemba died on the way to hospital and that a journalist who interviewed him earlier in the day had noticed that he appeared unwell. The journalist "told me that Papa Wemba was showing signs of fatigue. He was drinking water between every sentence", he said. The festival was held just over a month after the Islamist attack on the beach resort of Grand-Bassam on March 13 that left 19 people dead. Papa Wemba was born Jules Shungu Wembadio Pene Kikumba in June 1949 in what was then Belgian Congo, now the Democratic Republic of Congo. He won international acclaim when the fashion for African and world music took hold in Europe and the United States in the 1980s, and recorded with British rock star Peter Gabriel. "He was an icon, an artist of talent... it's a great loss for music," DR Congo Culture Minister Banza Mukalay told AFP. He added that the singer's body would be brought back to his homeland. "We are not going to let him rest their for eternity. He will be buried here in the DRC." A father-of-six, Papa Wemba was also known as the driving spirit behind a cult movement known as "Sapeurs" whose members -- young men -- spend huge amounts of money on designer clothes. He was also convicted in France in 2004 for smuggling illegal immigrants into the country. Papa Wemba had begun his singing career in religious choirs in which he developed his trademark high range voice, making his debut in the capital Kinshasa at the end of the 1960s. He inherited his love of song from his mother, who was a professional "wailing woman" at funerals. Like many of his generation, he was strongly influenced by American and British pop culture and initially took the stage name Jules Presley. Papa Wemba settled in France in 1986 as his fame began to reach as far afield as Japan, dazzled by the African dandy who was dressed by the world's leading designers. He went on to reach a much wider public thanks to a world music album produced by France's Martin Meissonnier in 1988, which blended African and Western sounds. Papa Wemba parted ways in 1999 with the Real World record label founded by Gabriel, the former Genesis singer. But he remained immensely popular in Africa, taking part in major music events including a concert in London for Nelson Mandela's 90th birthday. He was convicted by a Paris court in 2004 of smuggling illegal immigrants into France by disguising them as members of his entourage, but walked free as he had already served four months behind bars. CRTV General Manager en Route to Kondengui? Speculations as to whether Amadou Vamoulke, the General Manager of the state media house-Cameroon Radio Television, CRTV will join the former GM of the same institution at the Yaounde Kondengui Prison abound high. Allegedly, the boss of CRTV has been banned from travelling abroad and his bank account has been frozen. It is also alleged the man has been a constant visitor at the Special Criminal Tribunal where he is being quizzed on the management of funds allocated to that media outfit. Classified sources say he was barred from travelling to China recently. Allegations are rife at that he may likely join the former GM, Gervais Mendo Ze in prison over management errors. Amadou Vamoulke, it should be noted has been at the helm of Cameroon Radio Television for over ten years now. Yet could be amongst the latest catch of sparrow hawk. 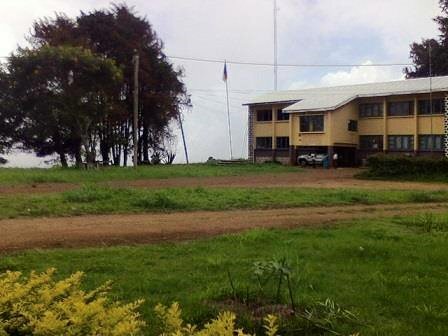 The reputation of Technical School of Agriculture-TSA, Nkambe has been taken into the mud and given heavy knock by its present management. The level of mishap at TSA Nkambe we gathered has reached the point that the school administration could only get solace thanks to the intervention of the Senior Divisional Officer for Donga Mantung Division. The population of Nkambe was taken aback when news spread that pedagogic staff of the school had issued letter, decrying the non payment of allowances a year ago and later last week took to the street to stage a peaceful protest march to the SDO's office to express their grievances. Reasons for the falling standards of training at TSA Nkambe have attracted much public discussions recently to the point that diverse opinions have been voiced out on the management skills of the Director of that school. Yet, a school of thought holds that education is a Human right that should be accorded to all humans as a threshold for moral, mental and moral development of human personality. And that TSA Nkambe is down into the doldrums as pedagogic staff and students are aghast. Though students have been silent over the absence of training instruments such as poultry farms, etc another school of thought holds that the sky rocket problem is indicative of administrative lapses and failure. The bad news follows other indications that teaching and learning standards at TSA Nkambe are slipping when measured against others. Other commentators suggested that the high rate of disorder and trickery moves is a severe blow to Government and bad news for the future of youths of Donga Mantung Division as well as many others who have passed through the school. "How can Donga Mantung hope to compete economically if our young people are not as well-trained as those in other places?, an authoritative voice questioned. The question many have been asking on the growing anguish at TSA Nkambe is whether a parent be averse to what was prescribed as school fees? The result of the cacophony is the high level of mess which is actually becoming a cause for concern.The reputation of the one-time citadel of education in Donga Mantung Division is being dragged into the mud. The management of the Cameroon Baptist Theological Seminary-CBTS and Joseph Merrick Baptist College-JMBC, all in Ndu have resolved to jointly tackle water scarcity in Ndu town. The CBTS Provost Rev. Dr. Nseimbo Johnson as well as JMBC principal Fru Festus have both acknowledged the fact that in order for Ndu town to solve the problem of water scarcity, the fight must be collective. They are quoted to have have told Savannah Radio Ndu that the two christian institutions are putting in place to improve on access to water in their institutions as well as to the public. 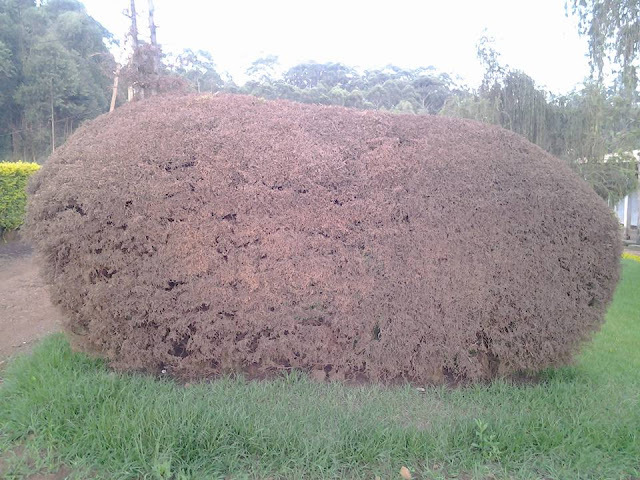 Besides, they have also revealed that strategies have been put in place to fell all the eucalyptus trees found around marshy areas. CBTS, it should be noted has also established a tree nursery with environmental friendly trees that will be used as replacements for the eucalyptus trees. Some of these tree species according to Rev. Dr. Nsiembo include amongst others prunnus africanus, grivillia robusta etc. This according to what we gathered is intended to mitigate the phenomenon of climate change. Preet Bharara, the U.S. Attorney in Manhattan, opened a formal criminal investigation into the Panama Papers, a document leak that allegedly implicates politicians, celebrities and business people in illegal financial dealings. Bharara, seen here in 2014, sent a letter to the International Consortium of Investigative Journalist asking for more information on the 11.5 million documents leaked from the Panama-based Mossack Fonseca law firm. The firm has denied any wrongdoing. Photo from U.S. Department of Justice. WASHINGTON, April 21 (UPI) -- The U.S. Justice Department launched a criminal investigation into the possible illegal activities outlined in the Panama Papers, the massive data leak of secret offshore accounts and alleged illegal financial dealings. Preet Bharara, the U.S. Attorney in Manhattan, said he wrote to the International Consortium of Investigative Journalists, which led a worldwide effort to report on documents leaked from Panama-based law firm Mossack Fonseca, to ask for information to assist in the criminal investigation. Bharara's office has jurisdiction over some of the world's largest financial institutions. "The office would greatly appreciate to opportunity to speak as soon as possible with any ICIJ employee or representative involved in the Panama Papers project in order to discuss this matter further," Bharara said. Bharara's efforts are the first indication criminal prosecutors in the United States are officially investigating the information contained in the 11.5 million documents. So far, U.S. authorities have only media accounts to verify the information. Officials began a preliminary review earlier this month. Stefan Cassella, a former deputy chief of the Justice Department's Asset Forfeiture and Money Laundering Section, told NBC News that New York is the natural place to begin such an international investigation because illicit funds are often laundered through New York banks. "They all want to be paid in dollars so the transactions go through New York," Cassella said. "It's just the way the global financial world works. The money passes through New York." The documents, leaked to the German newspaper Sueddeutsche Zeitung and analyzed by the journalist consortium, allegedly link politicians and celebrities to accounts that shield their money from taxes. Icelandic Prime Minister Sigmundur David Gunnlaugsson and Jose Manuel Soria, Spain's acting industry minister, resigned after they were linked to offshore accounts with questionable financial dealings. British Prime Minister David Cameron and Russian President Vladimir Putin have also been named in the papers, but both deny any illegal involvement. Barca with its heroic MSN combination has quietly being reduced to a toothless bulldog living on past glory with the team's current form. Having lost their last three matches in La Liga and got knocked out of the Champions League, Barcelona’s season is in danger of completely falling apart. Goal runs down the 10 reasons why it has all come unstuck so quickly. 10. MIXED MESSAGES FROM LUIS ENRIQUE: It seems strange to announce that the trip to Anoeta is "the most difficult away match of the season" yet then pick Rafinha and Arda Turan in midfield for the game against Real Sociedad. The Barca boss has also been unable to rotate his MSN attack with any real success and has largely failed to change games with his substitutions when things have been going against his side. He must take a significant share of the blame. 9. BARTOMEU ISN'T A MAN FOR A CRISIS: The Barca president has done little since winning the elections last summer. The club chief has failed to secure a new shirt sponsorship deal for next season, which meant Barca were unable to sign Nolito in January, and consequently has still not tied down Neymar to a new contract. Bartomeu did not ensure that the squad was sufficiently strengthened after last term's treble triumph. 8. MSN TIRED AND OUT OF FORM: Earlier this season, Luis Enrique described his famed forward line as the best trident in the history of the game and such was their brilliance, it was hard to disagree. However, Neymar has looked out of sorts since the Ballon d'Or and Lionel Messi has been a shadow of his usual self over the past few games. 7. LA MASIA ISN'T HELPING EITHER: Barca B's erratic season has hindered the first team as well. Luis Enrique has handed debuts to seven youngsters - Juan Camara, Gerard Gumbau, Aitor, Wilfrid Kaptoum, Romera, Carles Alena and Sergi Samper. The latter is easily the most talented of those, but has been largely overlooked and is also now sidelined through injury. In the meantime, the talented Alen Halilovic was allowed to join Sporting Gijon on loan for the season. 6. LITTLE HELP FROM THE BENCH: With the notable exception of Sergi Roberto, Barcelona's substitutes have not been up to the task for the most part in 2015-16. Luis Enrique does not appear to trust Munir El Haddadi or Sandro when it matters, while Jeremy Mathieu has made mistakes (like against Villarreal recently) and both Thomas Vermaelen and Marc Bartra are out of the first-team picture now, along with Adriano. As already mentioned, Arda and Aleix have also failed to convince. 5. RAFINHA'S INJURY: Luis Enrique is a big admirer of Rafinha, a player he took to Celta on loan and who looked set to feature heavily this season. However, the youngest of the Alcantara brothers was seriously injured against Roma in September and sidelined for six months, meaning he was unable to provide cover for the midfield and attack as planned. Barca lost a very good player and also one who would have provided much-needed depth from the bench. 4. PROBLEMS IN DEFENCE: So secure en route to the treble in 2014-15, Barcelona's back-line has had plenty of issues in the current campaign. They conceded only 37 goals last season, but have already shipped 51 this term (including four each against Athletic Bilbao, Celta Vigo and Sevilla earlier in the season). And although there has since been improvement, the goals of MSN have papered over the cracks for much of the campaign. 3. NO NOLITO, NO COVER FOR MSN: With Pedro gone and nobody to replace him, Barca set their sights on Nolito in the winter window but were unable to find the funds to sign the Spain striker. That has seen a large burden placed on the shoulders of Lionel Messi, Luis Suarez and Neymar, with the sheer volume of games taking their toll on Barca's fantastic forward line. 2. ARDA & ALEIX STRUGGLE TO ADAPT: Barcelona did sign Arda Turan and Aleix Vidal last summer and the two finally made their debuts when the transfer ban came to an end in January. However, they missed a total of 30 games and have been unable to adapt to the team since finally making their bows at the beginning of the year. 1. XAVI & PEDRO LEAVE WITH TRANSFER BAN ONGOING : Xavi departed after winning the treble and Pedro chose to join Chelsea in August, leaving Barca short of quality options on the bench and unable to replace them straight away, still banned from fielding new players in 2015. Open complaint to NEC: SDF Presidential Hopeful Barred from Party Activities! I, Felix Teche Nyamusa SDF 2018 Presidential hopeful (pending primaries) have recently been blocked from attending SDF meetings or permitted to attend but stopped from making contributions under flimsy excuses! Its worth mentioning that Felix Teche Nyamusa is SDF militant from conception of the party in 1990 and has held positions in same at various times and levels which include Tugi ward chair, district executive member of Mbengwi and Bamenda electoral districts and member of the provincial communication desk of North West Region (then province) and currently SDF presidential hopeful for the 2018 Cameroon presidential – it was the case in a North West regional reorganization planning meeting of March 2018(at Fru Ndi’s Ntarikon residence) with the SDF national chair His Excellency John Fru Ndi in attendance where your presidential hopeful was prevented from partaking in the gathering and again in another conclave at Fru Ndi’s Ntarikon residence this time of the Bamenda II district Saturday 16, April 2016 where I was permitted to attend but again controversially censored from contributing at the deliberations! It is worth noting that I after all was officially invited to this meeting by the district chair like I have attended other meetings here at the invitation of the past chairs. 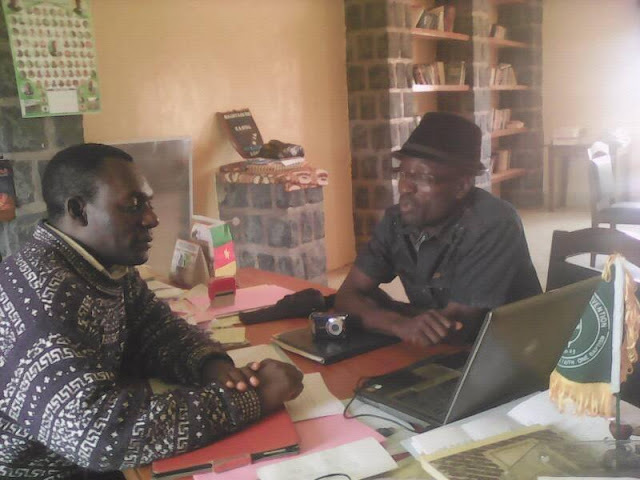 Today to some militants “Nyamusa is of SDF Mbengwi Momo and he is standing presidential primaries with Chairman Fru Ndi - he should be stifled at party activities!” It is worth mentioning that the Musang ward of chairman Pa Sembi in Bamenda II is my current SDF ward. I currently reside in Musang quarter of Bamenda II. When I am in the village - Tugi in Mbengwi subdivision of Momo division, I militate in the Tugi SDF ward where I am former chair. Where ever I go be it in Douala, Yaounde, North or any other part of Cameroon as well as in the Diaspora I have always made it a duty to identify and partake in my party SDF activities . My field experience over the years has exposed this unlawful, anti constitutional posture by some party zealots which hampers democracy thereby increasing apathy by discouraging aspirants and their following not only as it concern me but also with respect to other militants at various levels of the party perpetuated by (some of) the chieftains in their respective constituencies especially those afraid of competition or for sycophancy sake! - Part of the Preamble: - “We hereby reiterate our belief in individual freedom in the framework of a just society, political freedom in the framework of a meaningful participation by all citizens in the political process and mindful of the constitution of the Republic of law No 90/056 of 19th December, 1990. Pledge ourselves to an open and honest endeavour in the conduct of public affairs and in a manner worthy of a free people; convinced that the enduring strength of the Nation’s political institutions depends on the restoration of multiparty democratic practices. Affirm our conviction that a political party wishing to be trusted must prove its trust in the people. 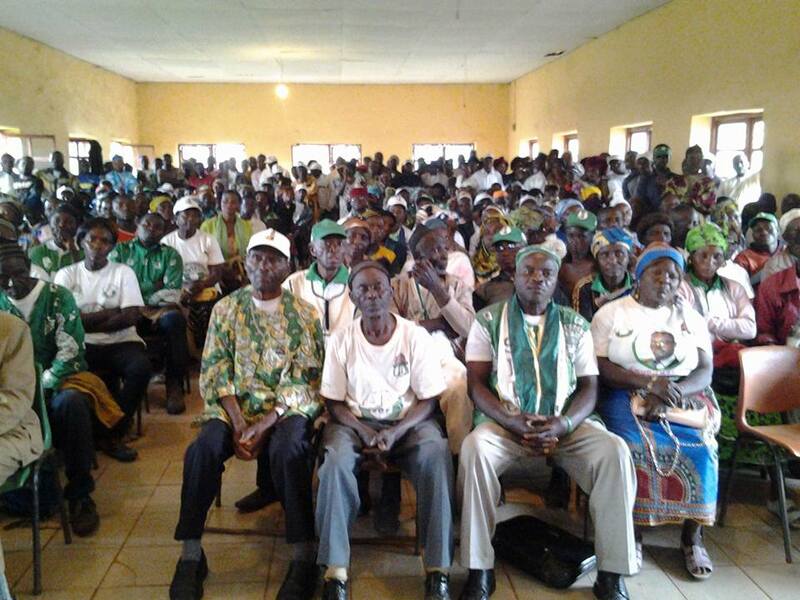 Thus per our SDF constitution, the presidential candidate irrespective of whether he/she holds a party executive position or just a bare militant has the entire Cameroon as his/her constituency and obviously has as a duty to sell his/her image, ideology and manifesto to fellow citizens through party meetings, rallies--- . It is only through this that militants, Cameroonians will know such candidate(s) in order to ascertain whether he, she or they deserve their votes at polls or not! Hence blocking them from fully and actively participating in meetings, rallies or other party activities I think is a disservice to SDF militants in particular and Cameroonians in general; unconstitutional; undemocratic thus weakening the party to say the least! Comrades, this is the ordeal the party, some party members including Nyamusa your humble presidential candidate (pending primaries) have been going through and we urge the national executive council (NEC) being one of the highest governing organ of the SDF party to get involved and educate militants and sympathizers against such party absurd, debasing actions! May God guide, SDF, Cameroon. The Panama leak that rocked the world has exposed Wale Tinubu, the relative of the All Progressives Congress national party leader. The revelations are products of an investigation, spanning over a year by the International Consortium of Investigative Journalists, German newspaper Süddeutsche Zeitung and more than 100 other global news organizations across the world. PREMIUM TIMES is the only Nigerian media organisation involved in the investigation. Documents obtained by the online news platform from the huge database linked Mr. Tinubu to at least 12 shell companies. Mr. Tinubu, documents show, secured the services of Mossack Fonseca to help him incorporate the companies in Seychelles, one of the fastest growing offshore jurisdictions in the world and notorious tax haven, the British Virgin Islands (BVI). The documents show that Mr. Tinubu is director in the following companies incorporated in Seychelles and the BVI. Investigation reveal that Mr. Tinubu is either sole director of most of the companies or has unlimited powers to make decisions. For Instance, files from the data revealed that on November 26, 2009, after a meeting of the “board of directors” of one of his shell companies, Keligh Engineering Corp, Mr. Tinubu was granted a general power of attorney as the sole signatory of the company. The “board meeting” where this decision was made was attended by three nominee directors, – Yvette Rogers (Chairman), Jaqueline Alexander(secretary), Verna de Nelson, who are actually employees of Mossack Fonseca. Mrs. Rogers had also served as nominee director in Stanhope Investment Ltd, Seychelles, one of the shell companies used by the imprisoned former governor of Delta State, James Ibori, to steal the resources of his oil-rich state. As part of its #PanamaPapers series, PREMIUM TIMES had revealed how Mossack Fonseca helped Mr Ibori, who is serving a 13-year jail term in the United Kingdom for money laundering, hide funds stolen from Delta State treasury through a web of offshore companies. In May 2007, Just like Mr. Ibori, the Oando boss also secured the services of Swiss asset management firm, Clamorgan SA, to help him incorporate Techventure Inc., Anglesey Management SA, Caine Trading Corp and Keligh Engineering in Seychelles while appointing Mossack Fonseca Geneva as registered agent and administrator for the shell companies. 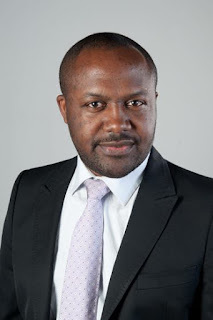 On May 2, 2007, Sebastien Thierry of Clamorgan S.A, who had acted as signatory for one of Mr. Ibori’s shell companies, wrote a letter to Sonia Scampa of Mossack Fonseca, thanking her for verifying and assisting in registering the companies, as well as granting Mr. Tinubu the power of attorney. It remains unclear why Mr. Tinubu hired the same offshore consultants used by Mr. Ibori to run his offshore companies. But in September 2013, British prosecutors told a court that Mr. Ibori confessed to owning “significant” shares in Oando Plc. According to crown prosecutor, Sasha Wass, a Queen’s Counsel, while opening an account at Swiss bank, PKB, through a shell company called Stanhope Investment, Mr. Ibori told the bank he owned 30 per cent of Oando. Oando had denied that Mr. Ibori’s wealth was hidden in the company. The company at the time circulated a statement claiming that Mr. Ibori only had 443 shares of the company’s 6.8 billion ordinary shares. The worldwide Panama Papers scandal claimed a fresh political victim Friday as Spain�s industry minister resigned over allegations he had links to offshore companies. Soria’s troubles began on Monday when Spanish online daily El Confidencial, which has had access to the Panama Papers - millions of files leaked from law firm, Mossack Fonseca - said he was an administrator of an offshore firm in 1992. It is unclear as yet whether any of his alleged actions were illegal. Soria is the latest political victim of the Panama Papers leak, which revealed how the world’s wealthy stashed assets in offshore companies and which the law firm blamed on a computer hack. “When that doesn’t happen, one must assume one’s responsibilities,” he added, in an indication that he was resigning due to how he had handled the revelations, rather than over any irregularities. The initial revelations showed that Soria’s name appeared alongside his brother’s as administrator of a company based in the Bahamas created through Panama-based Mossack Fonseca. He denied any links to that firm, and said he had told Spanish prosecutors to clear his name with the Panamanian authorities. But then other media revealed that Soria had links with another company based in the offshore haven of Jersey until 2002, when he was mayor of Las Palmas in Spain’s Canary Islands. When we look at what Time has done to the youthful ambitions of rigour and moralisation, one can only get amused at the casualties that the fading ambitions left on their tracks. One of such casualties is most obviously Issa Tchiroma. I call him a casualty because I knew him closely in what history will remember as the Coalition for National Reconciliation and Reconstruction (CNRR), composed of a score of them – opposition leaders – who were determined to dislodge Paul Biya in 2004 from Unity Palace. I was the Permanent Secretary of CNRR. I took him for a serious opposition leader because of the solemnity with which he mumbled the pledge each of them made at each of the regional rallies we held in all ten regional capitals, with the tricolor raised above the assembled leaders, and with each invoking the people and swearing that they would be the last to betray them. In fact, Issa Tchiroma actually wept on the podium in Garoua at the rally he hosted, when the parting speech of Ahidjo was played to the assembled rally attendants from a tape recorder; and he made a rousing, passionate welcome speech. He would later preside over the single-candidate selection meeting of the Coalition that resulted in the rubbishing of those pledges. To that extent that I knew him, I took him seriously. Based on that, I consider him a casualty. But some may say that if we add the chemical transformation that has converted him from a foe of the regime to a fanatic of the man of November 1982, he may be disqualified as a casualty. No matter! During the recent cacophony of “calls” and marches in the CPDM, he was seen marching in the East region, either in solidarity or as a surrogate member of the party, urging their hero to hang on. More recently, he has been indulging in the CPDM folly of using numbers, proportions and percentages to define freedoms and rights. And so he has been casting aspersions at opposition leaders that have been sending warning signals to his hero, because they are “minority” leaders! The story goes that Publius Clodius Pulcher who eventually brought down the corrupt and repressive system of the Roman Republic millennia ago, was a smart, charming and determined person with a keen sense of politics because he was very much in touch with the frustrations of the common people. Even if the ruling elite called him an eccentric and despised him because he was considered not to be a “real man” who could take care of the republic, the same elite eventually stood dazed and helpless as the populist forces he unleashed took control of the Roman Republic the regime had ruled for centuries! This is to remind us that all really important innovations and changes usually start from individuals or tiny minorities of people who use their creative freedom to chart new paths. So Issa Tchiroma, percentages don’t count here! “The ‘tyranny of the majority’ was so anathemic to the Founding Fathers that they managed to write the Declaration of Independence and the Constitution without mentioning the word ‘democracy’ even once in both documents…”! So, in this folly of percentages, proportions, and majorities of the CPDM and Issa Tchiroma, what is the difference between the dictatorship of a tyrant, a monarch, or a “majority”? We have heard it said before: It is better to let ten criminals go free than let one innocent person be convicted; when one person suffers injustice, there is no justice. Free public discussion of the stewardship of government through newspapers, publications, rallies, conferences is not supposed to be judged on the basis of numbers, percentages, minorities and majorities.As some people imbued with the democratic spirit would say, anywhere citizens may decide to gather to talk about their government and its policies, or anywhere that a lone eccentric or group of non-conformists gather to voice their opinion, they should be heard, not harassed by a regime, however offensive their opinion may be! If we go by their efforts to place party cards for free, CPDM militants do not reach even hundreds of thousands of the 20-some million arms we have in Cameroon. And they with Issa Tchiroma have been trying to bully the whole country to adopt their point of view! Even if Issa Tchiroma’s Arithmetic is muddled in this case, he surely has heard about minority rights in a democracy. Cameroonians are in a fix in a society sharply divided between us and them - torn by mutual suspicion, with the abhorrence of authority from below and a frightening contempt of the people from above. We are trapped in a Kafkaesque society in which everybody takes orders from a superior who takes orders from a superior who takes orders from… In the confusion, the National Communication Council is on its own side bullying and brutalizing the press to toe an imaginary line, while DOs and SDOs are on their own side arresting and brutalizing the rest of us to stay quiet and watch the macabre actions of the regime! In this society of La Loi/The Law populated by “authorities” whose answer to every complaint is “I did not make the rules; I am simply applying them…,” Cameroon is the loser, while the selfishness of individuals goes about triumphant. We may regret it for a long, long time! the pathway to the future we want for all. It offers a framework to generate economic growth, achieve social justice, exercise environmental stewardship and strengthen governance”. Though society is such that some people create policies through speeches, other uses such speeches to effect positive changes in communities around the world. Development is a complex issue. Getting involved in security and peace initiatives that could generated a more stable world, peaceful environment and mutual co-existence is the most effective way of fighting poverty and achieving the MDGs. Very often, we think sometimes that poverty is only being hungry, naked and homeless. But the worse part of poverty is when people have nobody who provides ideas or who could support innovative ideas that could lead to sustainable actions around the world. For sometime now, Cameroonians have been eager to knowing what the Cameroonian Diasporas could contribute towards the much talked-about Vision 2035. At The Eye newspaper, we are committed in bringing to you the worth of some Cameroonians in the Diasporas who could make significant contribution in nation building. One of such persons who has been and is providing remedy to this kind of poverty is Blaise Nkfunkoh Ndamnsah. He hails from Donga Mantung Division and currently living in Italy. He works as a train Cultural Mediator at the CARA Refugee Center Gorizia-Italy. He is the Vice Director to the Security and Defence Research Center in Gorizia. In conjunction with the trade union Cisl (Anolf-Gorizia) he is President and Legal Representative for the County Immigration Office. 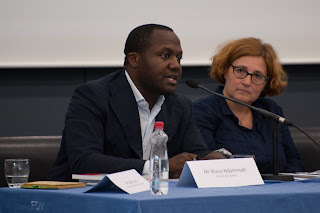 Besides that Blaise Nkfunkoh is a public speaker and has offered lectures as Guest speaker and visiting lecturer at some European Universities( University of Padova (Italy), Ljubljana(Slovenia) on conflict analysis, Peacekeeping and Human Rights issues. He teaches English language and Geopolitics at the University of the third age in Gorizia- Italy (Università della terza età di Gorizia), As an external Collaborator with the Slovenian Defence Cluster Industry, Blaise is representing Slovenian industries to some African Defence Ministries. Currently he is a Doctoral candidate in Defence studies – at the University of Ljubljana. His research interest is “Cultural awareness training tools for Multinational Military Operations. A critical Analysis of the Multinational Land force(MLF)”. Blaise Nkfunkoh is not a man to pigeon-hole with, whenever we make a closer look at his trappings in providing remedies to the world's most pressing issue as well as his innovative ideas at community levels. It is this art of reaching of reaching out to the world and providing remedy that is making him dissimilar from others. Many Cameroonians are still to crush such a feat. Not only is he the only one, who severally has been promoting the idea of peace and security in Africa, he has gone beyond that to making significant contribution in some European countries. Talk to him on this very pertinent issue and you will know you are with someone who is out to set example for others to follow. He is of the school of thought that holds that if there is peace and security in Africa, development will be sustainable. He has not only demonstrated this as Guest Speaker but has put all these ideas into books/publications. The most interesting thing about this young and dynamic luminary is that he believes like Martin Luther King that “working is praying” and by so doing, his human and divine acts overrides, the human one bringing him closer to God and the communities. One famous philosopher once wrote that “if a man could mount to Heaven and survey the mighty universe, his admiration of its beauty would be much diminished unless he had some to share in his pleasure”. This clearly indicates that life harbors a vacuum and great people can only be identified when they interact in society. In other words, many people in society are just stage decorations while those who work hard in life stage the property to excellence. In fact what keeps the world intact is trust and society is so multifaceted that we are becoming short of role models like Blaise. Yet it is not a given to have such a role model. Blaise is one of those persons with a prolific slate. He is a man of a specific class and stands out clear in the madding crowd. The most comfortable act on earth they say is to leave a legacy that would be remembered. From every indication Blaise has the knack to contribute enormously in improving lives around the globe and Cameroon. In one of his publications on the way such as: Cameroonian officers and commanders participating in a joint Cross National research on asymmetric warfare operations: old wars vs. new wars – the war against Boko Haram, he outlines all the necessary views and concepts. In fact judging from what the great and influential 18th century writer and social critic, John Gardner said of great leaders, Blaise has “a significant role in creating the state of mind that is the society". To Gardener, “great leaders can express the values that hold the society together. Most importantly, they can conceive and articulate goals that lift people out of their petty preoccupations carry them above the conflicts that tear a society apart, and unite them in the pursuit of objectives worthy of their best efforts”. John Gardner might have been writing about his 18th century Europe, but the issues he raised then are as urgent today as they were then. Issues of leadership, values and principles, and above all, peace, security and sustainable development are as poignant in today’s society as they were in the 18th century. Our societies, talk less of such people in Cameroon. Yet we had to move into the wilderness to look for one of such role model. In fact a Role Model as prescribed by Aristotle in his concept. 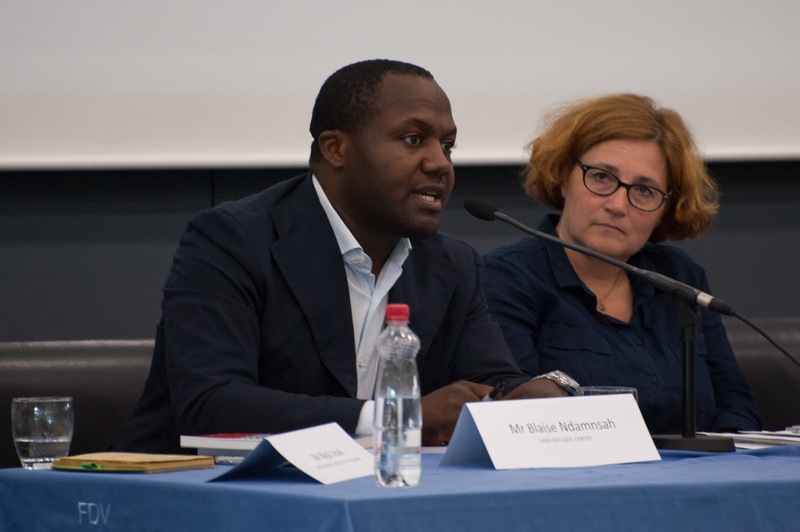 Blaise Nkfunkoh has a wide knowledge in the Protection of Asylum seekers and the role of cultural mediation in Italy. In one of his on the “CARA” refugee centre of Gradisca D’isonzo(Go)-Italy he portrays what it takes. As Lewis H. Lapham puts it “Leadership consist not in degrees of technique but in traits of character; it requires moral rather than athletic or intellectual effort, and it imposes on both leader and follower alike the burdens of self-restraint”. But Blaise is a man with a very rich education background. It has also been about his beliefs that a better way to bring meaningful development to an area can as well be through politics. He then decided to fine-tune politics with his technological aplomb. As frontline militant of the CPDM who believes that for now, it is only the CPDM that can change the lot of his people, he decided to offer his time and experience to the building of a good image for the CPDM in Italy. His new generation militancy and his non-confrontational nature won for the CPDM many sympathizers. Interestingly, many of his lovers in the peace and security domain continued to remind him that they love him as a person but that he was riding the wrong horse. As convincing as a church priest, he could hammer a point that will guide them to understand that they should follow real power that signs for development projects. And that meaningful development only comes from government. Back home at Bih village, he is celebrated for bringing development to the doorsteps of his people. Of late, he was in the news to have lobbied the Italian couples who visited Donga Mantung Division to donate to schools, medical centres and palaces. To describe Blaise as genius is give honour where it is outstanding. After a careful assessment of the potentials of those who passed round as leaders of the people in challenging times, Gardner was forced to come up with what he considered qualities of a good leader. In doing this, he had no bias or no particular individual in mind. His postulations on a good leader corresponded with what yet another greater leader of all times, Martin Luther King said. According to Martin Luther, “A genuine leader is not a searcher for consensus but a molder of consensus”. Martin Luther King was simply overwhelmed by the quality of leaders around him as they fought the battle of equality between black and whites in the United States of America. Martin Luther was appalled not only by the number of quack but also kangaroo leaders that were doted in the black and white communities in the United States soon after independence. He saw in most leaders the individuals who rather than mold consensus in times of conflict went searching for consensus. He was also bothered about a leadership that was not committed and purposeful. His worries soon found expression in Dan Marino’s reflections that “Leadership, I think you must have that, particularly when a team’s on the field, they look to you. In critical situations, they look into your eyes to see if you’re there. If you’re not there, they start quitting”. Most of our leaders have fallen into this category. They quit even before the game is over, not knowing that the game does not end with the referee’s last whistle or when the crowds go home. It ends hours and years after the real match was played. When others are singing a hymn, the level-headed Blaise Nkfunkoh Ndamnsah is singing a lullaby for the world to live in peace. When others think they have reached the end of the road, he thinks the journey is only beginning by protecting the interest of Asylum seekers and or giving out lectures to students. When others are taking only their needs into consideration, Blaise is taking his abilities to the world. Like a true servant leader, he does not wait to be told what to do, he goes ahead and does what he thinks is for the interest of a greater majority. And there he is available to play the real match for the importance of compassion that Cameroon expects from the Diasporas in order to guarantee peace, security and sustainable development at this point in time that the country is at war with the Islamic Sect, Boko Haram. 1. Author: Cameroonian officers and commanders participating in a joint Cross National research on asymmetric warfare operations: old wars vs. new wars – the war against Boko Haram. 2. Co-author: Diversity and Cultural Issues in Multinational Military Operations. Case of the Italian-Slovenian-Hungarian Trilateral Brigade. 3. Author: Protection of Asylum seekers and the role of cultural mediation in Italy: An analysis of the “CARA” refugee centre of Gradisca D’isonzo(Go)-Italy. SLOGA Journal-Slovenia.  Cultures, ISAF and Geopolitics in Afghanistan, to undergraduate students in defense studies –University of Ljubljana-Slovenia. 06/01/2014. (Part of his PhD research curricular).  YPFP (Young Professionals in Foreign Policy)-Brussels.  UACES (University Association for Contemporary European Studies)-London.  CRN (Collaborative Research Network) on CSDP(Common Security and Defence Policies) Strategy.  Regional registry for cultural Mediator, FVG region in Italy.